As one of the most successful nail care brands in the world, OPI are widely sought after by both professionals and consumers alike for their high quality nail treatments, and beautiful range of nail colours. They have over 270 shades of OPI nail polish and have recently released two new exciting collections based on two very different glamorous famous icons. Working with the world famous singer Mariah Carey they have launched a limited edition glittering collection of eight unique shades inspired by the singing superstar, four of which are special ‘liquid sand’ lacquer which is worn without a top coat to provide a textured matte finish with reflective hints of light, that lightly shimmer with the fine glitter particles. The collection includes ‘The Impossible’ a matte fuchsia polish with light reflective shimmer, ‘Can’t Let Go’ a deep purple polish with a matte finish with sparkle, ‘Get Your Number’ a matte blue with sparkle and ‘Stay the Night’ a matte black with red shimmer. We would expect nothing less than luxury from Mariah Carey, and this fierce nail lacquer definitely does not disappoint! Boasting a lavish creamy formula that coats your nails in a chart smashing shade. 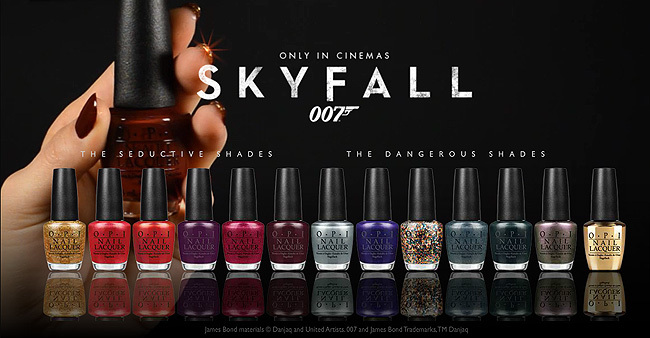 The second collection, Skyfall, has been created in conjunction with the 50th Anniversary of the James Bond films. 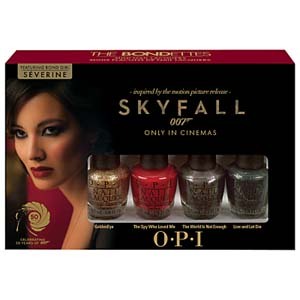 OPI have launched a collection in which each shade is named after one of the classic films. These capture the style and imagination of the film by including seductive and dangerous shades from metallic and glitter finishes to jewel tones and even a jet black. These colours are simply out of this world and perfect for not only livening up an classy night out but are suitable for everyday wear too and a great representation of the classic Bond-Girl style. The 18-karat gold leaf topcoat sold out in hours at its launch at Olympia Beauty in London, which only reinforces its popularity.